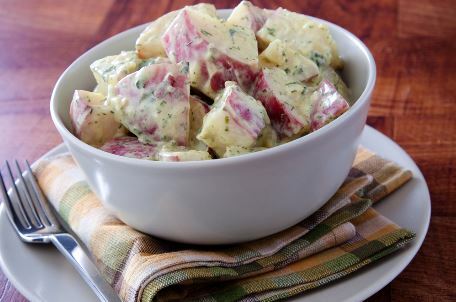 It’s a shame that it’s nearly impossible to find a healthy version of potato salad. It’s such a savory treat and perfect pairing to any meal really. This recipe is sure to fill that craving, and has a ton of added benefits to go with it. We just talked about the benefits of Resistant Starch, so here is a delicious way to get that starch in tonight. Measure out ⅔ cups of raw cashews and put them in a bowl. Add enough water to cover the cashews in the bowl and soak overnight. Begin boiling a stockpot of water. Next, rinse and slice about 10 small red potatoes into quarters and carefully drop them into the water once it reaches a boil. Let these cook for about 15 minutes to reach desired consistency. Drain the cashews and add them to a blender with 2/3 cup of water, 2 teaspoons apple cider vinegar, and a pinch or two of sea salt. Blend until completely smooth. Once the potatoes are fully cooked, carefully drain them through a colander and rinse them with cold water to stop the cooking process. Then, add them to a large mixing bowl with some lemon juice and a pinch of salt & pepper. Begin slicing 3 stalks of celery, then very finely dice about 2-3 tablespoons of red onion, chop up 2-3 sprigs of fresh dill, and grate a tiny bit of lemon zest. Then, add the cashew cream to the potatoes along with all these ingredients (celery, onion, dill, zest) and carefully mix. Finally, cover potatoes in a glass tupperware, and chill before serving. You may now add any additional seasonings for topping.